The President of the Republic, Mr Nicos Anastasiades, met today, at the Presidential Palace, with the President of the State of Israel, Mr Reuven Rivlin, who is paying a state visit to Cyprus. The President of the State of Israel arrived at the Presidential Palace in the morning, where he was officially welcomed by President Anastasiades, while a military guard was presenting honors. The performance of the national anthems of the two countries followed, and then President Rivlin laid a wreath at the statue of Archbishop Makarios III, the first President of the Republic of Cyprus, in the courtyard of the Presidential Palace. Subsequently, the two Presidents held a private meeting which was followed by expanded talks between the delegations of the two countries. Later on, the two Presidents made remarks to the Press. In his remarks, President Anastasiades said that “it is a distinct pleasure to welcome my dear friend, the President of the State of Israel, Mr Reuven Rivlin, and his delegation to the Presidential Palace and to be offered the opportunity to reciprocate the warm hospitality extended during my state visit in Israel in June 2015. Your visit, Mr President, constitutes another important milestone in the relationship between our two countries, since, during our fruitful meeting we did not only reaffirm the excellent co-operation and synergies we have established both bilaterally and multilaterally, but we also exchanged views and ideas on further strengthening our mutually beneficial partnership. Though I do not intend to dwell on the past, I need to briefly place the relationship between Cyprus and Israel in its proper context. Our relationship is truly historic. One could refer to the historical records which illustrate the Jewish presence in Cyprus before the Roman era and the constant interaction between our peoples since then, but no reference to the historic relations of our two nations could be complete without mentioning the role that Cyprus played in the establishment of the State of Israel. From 1946 until 1949, the British established camps in Cyprus, where more than 50,000 of Jewish refugees, on their way to Mandatory Palestine, were interned. The people of Cyprus, without any hesitation, embraced the Jewish refugees from Europe during the shameful drama of the Holocaust and once the State of Israel was created, most of the refugees, including 2,000 babies born on the island, moved to their homeland. All these examples constitute part of our collective history, a history determined by the geography of the Mediterranean which has linked us together historically, culturally, politically and economically. In this regard, I am extremely pleased to assess that Cyprus and Israel have now embarked in a new era of partnership. A new era based on our common vision: To substantially and strategically upgrade our relationship in all possible fields of co-operation, especially on energy, security, economy, tourism, research and innovation. Cyprus’ foreign policy is guided by our vision of transforming our neighborhood through cooperation and establishing synergies. Within this prism, we see the development of our relations with all our neighbors as a vehicle for promoting security and stability across the entire region. Energy is of course a strategic pillar of our cooperation which creates a very positive regional interest as proven by our joined commitment to the EastMed pipeline, a project that taps to the security of supply and energy diversification of Europe. At the same time, we also consider the trilateral partnership we have established with Israel and Greece to be one of significant geostrategic value. Our synergies are beacons of hope, the voices of reason and an exemplary choice that can ease tensions, assist in resolving conflict and in providing a regional tool - kit for a widely beneficial code of conduct. During today’s discussions, I once more assured the President of the State of Israel that Cyprus, which shares mutual principles and values with Israel, is not only a neighbour or Israel’s border with the EU, but a stable, secure, reliable and predictable friend. Our position, specifically on EU-Israeli relations is crystal clear: Israel is a very important strategic partner and a stabilizing force in the Middle East region. Cyprus will continue to be an advocate in support of the security of the State of Israel, and calling for refraining from unilateral measures which could detrimentally affect EU-Israeli relations or even Israel’s own security. We also exchanged views on crucial regional issues and challenges and reviewed ways of combating asymmetric threats, such as the growing surge of terrorism. In this context, we reaffirmed our commitment to the security for our citizens and the stability of our region. I also had the opportunity to thoroughly brief President Rivlin on the latest developments on the Cyprus problem and the efforts of the Special Envoy of the UN Secretary-General to reach an agreement on the ‘Terms of Reference’ as regards the way forward. I reiterated to the President that the vision of all Cypriots remains none other than to reach a viable and functional settlement that will reunite Cyprus in a truly independent and modern European state, free of any foreign dependencies. Taking this opportunity, I wish to express the sincere gratitude and appreciation of the Government and the people of Cyprus to the President and the Government of Israel for the principled stance and important support they offer to Cyprus in our efforts to reach a comprehensive settlement in line with the UN Security Council Resolutions. Lastly, we touched upon the state of play on the Middle East peace process and the prospects for the return to direct and meaningful negotiations. I reiterated our support to a two-state solution and peace deal that would bring about peace, stability and prosperity for Israelis and Palestinians, which would benefit the entire region and its peoples. In this respect, ensuring the security of Israel is fundamental to any plan. I also reaffirmed that Cyprus will continue its contribution towards that end through its active participation in the EU and the UN. On his part, President Rivlin said that “t is a real pleasure to be here in the Republic of Cyprus. This is both a state visit and a visit between neighbours. Indeed, we are true neighbours and good neighbours. Israel shall not forget how Cyprus sent a real support in 2010 when we had serious forest fires. As for today, we have excellent cooperation in emergency, in medical care and the security ties between our two countries have never been better. Our navies and commando units share space, knowledge and experience. Of course, not everyone can be mentioned in this form but there are many fields and subjects (of cooperation). Thanks to our intelligence, security and terror prevention cooperation Cyprus and Israel and the Mediterranean are much safer. How we are looking forward to share growth and prosperity. Our economic ties are strong and they are growing stronger with over $650 million in commerce per year and almost a quarter of a million tourists who are coming to your beautiful country and I would like to invite your people to visit us. They are more than welcome. We recently signed a trilateral agreement together with you and Greece. We are three countries but we aim to form a shared economy based on the flow of energy information and electricity. Our prime focus right now is on developing the Eastern Mediterranean pipeline. This could be one of the greatest underwater projects in the world. Green and clean energy, together with information technology are not only an urgent need for all of us they are also an opportunity for all of us. They are the real future. Cyprus and Israel can and must partner around shared interests and true friendship. This bilateral strategic partnership is now a trilateral one together with Greece and it can be extended into a larger partnership as we were talking together in our meeting. Energy cooperation with parties in the East Mediterranean can make a greater difference for the peoples of Cyprus, Israel, Greece, Italy, Egypt, Jordan and the Palestinian people and the Palestinian Authority. Later on, the President of the Republic hosted a state banquet in honor of President Rivlin, at the Presidential Palace. In his toast at the banquet, President Anastasiades said that “I am delighted to welcome you to Cyprus and to be given the opportunity to reciprocate the warm hospitality that you had extended to us in Jerusalem, during my state visit in June 2015. I am proud to say that this important occasion coincides with a time during which relations between Cyprus and Israel have never been stronger. Our current partnership is a strategic choice that goes far beyond our geographical proximity and the sea border that we share. Our friendship is anchored on the common vision for a stable and secure future - for our countries, our peoples, and our region. Your presence in Cyprus is a testament of the continuation of the positive historical record of bilateral relations between our two countries. Our peoples have interacted with each other and prospered from this beneficial contact for centuries. Kosher wine from Cyprus was used in the Temple of Solomon. Kafricin (the name of Cyprus in Hebrew) is the only country in the world which is mentioned in both the Babylonian and Jerusalem Talmud. We also know that soldiers from Cyprus served in the Judean army, in 600 Before Common Era / Before Christ, while during the Hellenistic period, a Jewish community was established in Cyprus which lasted until the Roman era. What’s more, during the Ottoman era, Sephardic Jews, after their expulsion from the Iberian Peninsula, sought refuge in Cyprus. Moreover, Cyprus played a small yet significant role in the history of modern Israel, when Cypriots provided assistance and embraced thousands of Holocaust survivors on the way to their homeland. For around 53.000 Jews, Cyprus was the final frontier on a journey to the “Promised Land”, during their exodus from the concentration camps to a free and better life. More than 2.200 children were born in camps in Cyprus, and many of them return - and are mostly welcomed - to their place of birth. The connection of Cyprus and Israel is about friendship. This is what brings our peoples to cross the 330 kilometers between our lands for business, for study, for medical reasons, for leisure or even to get married. Friendship is what made almost 300,000 tourists from Israel visiting Cyprus only last year. Friendship is also what makes us to immediately tend to each other’s side in times of terrible natural disasters. And I take this opportunity to express our gratitude for the indispensable assistance that Israel has offered in times of need. In the sadness of such disasters, it is important to have true friends to rely on. And this is exactly what Cyprus and Israel are: reliable partners that see eye-to-eye on a wide agenda of issues ranging from energy to security, to innovation, to academic research, to business, to counter-terrorism, to tourism, to health, and to the cooperation between our diasporas. This common language enables us to stand by each other in these testing times when our common values are being challenged. One of these horrific evils is of course Anti-Semitism. It is fundamental that Anti-Semitism is combated, in all its forms, by determined action by Governments and civil society. This is our collective duty. I would like also to assure you that as a neighbor with its pulse on the region, Cyprus will continue to serve as a bridge between Israel and the European Union, consistently advocating a positive agenda between EU - Israel. Cypriots know very well that peace is an expensive commodity in our common region. And despite how elusive the search for peace is, they also know that hope for better times for the generations to come must be upheld. In this regard, I wish to reiterate my firm commitment to reach a comprehensive settlement on the Cyprus problem which will end the division of Cyprus and its people and establish a truly independent and sovereign state, free from any anachronistic system of security and guarantees by third countries. Having said this Mr President, I would like to also express my personal appreciation, the appreciation of my Government and of the Cypriot people, for the principled stance of Israel regarding the Cyprus problem. Cyprus will also continue to endorse efforts in assisting the return to direct and meaningful negotiations, with the aim of resolving the Israeli – Palestinian conflict and fostering long term peace. In this respect we consider the security of Israel to be fundamental. Likewise we are very clear that any rhetoric, attacks and ballistic missile activity against Israel is utterly condemnable. In welcoming you to Cyprus let me assure you that the close partnership between Cyprus and Israel will continue to generate a strategic merit with very positive geopolitical impact. Cyprus and Israell stand, and will continue to stand together in addressing the threats of terrorism, extremism, and radicalism, as pillars of stability and exemplary cooperation in a regional alliance. 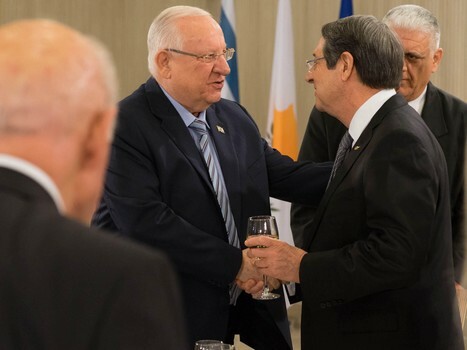 With these thoughts, I propose a toast to the health and happiness of the President of Israel Reuven Rivlin (Ρεούβεν Ρίβλιν), to the progress and prosperity of the friendly people of Israel and to the close friendship between Cyprus and Israel. Concluding, on a happy note, President Rivlin said that he hoped that Israel winning the Eurovision song contest and Cyprus coming in the second place will not be a factor that would create tension between the two countries, and expressed hope that Cyprus will win the next Eurovision song contest that will be held in Israel in 2019.